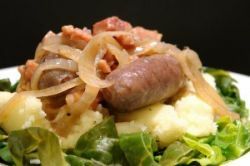 This is sausage and mash with a difference. It is real comfort food and so easy to make. I like to serve it with mashed potatoes and greens. The potatoes I mash with butter and olive oil. I have used beef stock in the recipe but you could use red wine instead. The venison sausage could be substituted for something like wild boar. 1. In the inner pot brown the sausages in olive oil. 4. Stir in the flour until the juices are absorbed. 5. Add the beef stock, thyme, bay leaf, juniper berries and balsamic vinegar. 6. Bring contents to the boil. 7. Put on the lid and turn down to a simmer. Simmer for 5 minutes. 8. Turn off the heat and place the inner pot into the insulated outer container. 9. Shut the lid and thermal cook without heat for a minimum of 1½ hours. 11. Stir in the fruit jelly and once this has melted serve with mashed potato. NOTE: This recipe is supplied by Chef Dave Knowles from the UK and is described for a 4.5 litre inner saucepan so you will need to adjust quantities if you are using something else.